The Weiner residence was designed in the Old English Revival style, reminiscent of a half timbered English Manor house. Located on desirable Loucroft Road in Haddonfield, the house is situated on a 100’ x 200’ lot. The house is framed new construction, with true stone and stucco walls, copper gutters and downspouts, half timbering, with stone crenellations above the front facing bay. 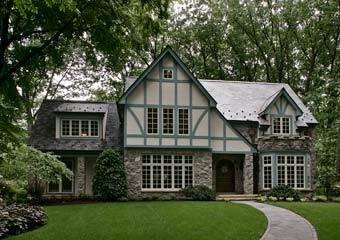 The roof is design with real multiple colored slate custom blended to work with the colors of the exterior. An extra wide custom front entrance door with circle light adds to the curb appeal of this well appointed house. 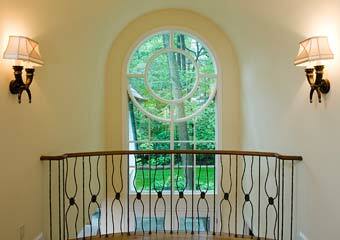 The back of the house has a slightly less formal feel, with custom designed windows in the study and above the stair hall. These less historic style windows relate to the owners personal taste and view to the well landscaped property. 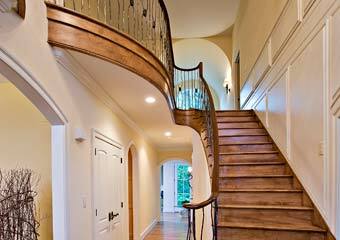 Inside, the foyer is graced with a custom curved stair with hand made balustrade of wood and iron. There are two open balconies that overlook the foyer from the upper levels. A living room to the right and dining room to the left include all natural hardwood floors. The kitchen includes a large central island and is open to a family room with fireplace and glass walls to the yard. At the back of the living room is Andy’s office, a custom paneled room with matching furniture and finishes. The house includes a first floor bedroom suite and two car garage. Upstairs, four additional bedrooms with two baths and a laundry room are located on the left side of the house and the master suite, with cathedral ceiling, walk in closet and tiled bath on the right. The master shower is the most unique, shell shaped with no door, multiple heads and seating makes this an amazing shower.